No he did not. 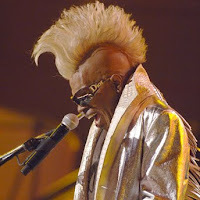 And I apologize to Sylvester Stewart, his relatives, friends, colleagues and fans for the title. But this is an attempt to get props for Sly BEFORE he dies. For on the day of his death, the media will celebrate him with clips of his greatest hits and moments instead of celebrating the man while he is alive. Why not do the tributes now? His accomplishments are as great now as on the day of his death. Why not share this with the man while he is alive so that he can soak up some cheer for the cheer he gave us? 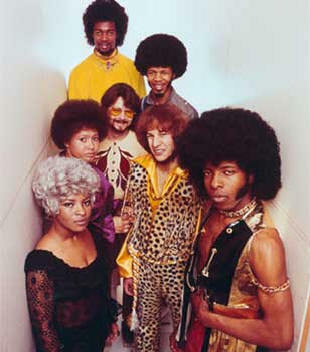 Sly & The Family Stone, at their height, were as big as any band could get. As big as the Beatles and the Rolling Stones. Bigger than the Jackson 5 and the Beach Boys. 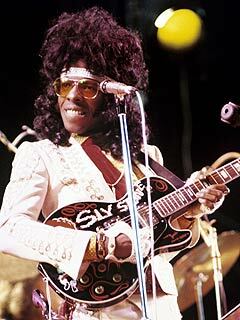 Sly was as big as Elvis and The King eventually copied Sly's sideburns, jumpsuit outfits and buckles. Sly spawned a plethora of similar sounding bands, with variations on the theme of course: Funkadelic, Earth, Wind and Fire, Con Funk Shun, The Bar-Kays, Kool and the Gang, Mandrill, and many many more. 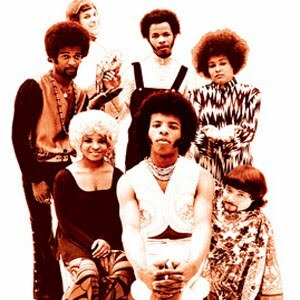 By the time Sly & The Family Stone had burned out, the land was covered with bands that had adopted the best of their sound. Place Michael Jackson's "Thriller," Prince's "Purple Rain" and the Beatles "Sgt Pepper's Lonely Hearts Club Band" next to Sly and The Family Stone's "Stand" (plus "Thank You") and there is no contest. S&TFS win hands down. MJ's moonwalk on "Motown 25" was supercool, but was not the cultural event that the Sly & The Family Stone set represented at "Woodstock." S&TFS dominated the movie, album and live performances. Now the tributes will include the missed concerts and the drug abuse subtext to the Sly story, but none of that can take away from their rise to fame and their legacy. That legacy is still in the grooves, er, digits. Sly would have been nothing without the Family Stone and the Family Stone would have been nothing without Sly. There never would have been a Graham Central Station without Sly & The Family Stone. So give Sly & The Family Stone their props now. All of the band members are still alive. And although too much muddy water has run under the bridge for them to reunite and attempt to reprise the past glory, nobody can take away what they did in their prime. Maria Shriver (now Maria Shriver Schwarzenegger) interviews Sly in this early documentary.